2019 NCR Mike Hailwood TT. Picture credits - NCR. Submit more pictures. 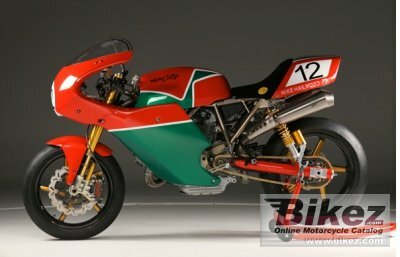 Only 12 MIKE HAILWOOD* TT motorcycles will be produced. Engine details: Ducati NCR 1120. Titanium connecting rods carved out of billet, high compression forged pistons with single piston ring, custom F1 type crankshaft from billet with longer stroke, NCR CORSE cams, titanium valves, ported heads. Exhaust system: Full titanium exhaust system. Frame type: Titanium frame weighing only 5 Kg (11 lbs). Front suspension: Ohlins FGR 900 pressurized MotoGP fork tuned by NCR. Triple clamps made from AL 7075 with adjustable offset from 28 to 36 mm in 1 mm increments. Rear suspension: Ohlins dual shock tuned by NCR. Color options: Red/green/white. Historical Mike Hailwood NCR colors with a pearl base. All air brushed. Comments: Carbon fiber bodywork. Poggipolini Titanium fastners. Limited edition. Ask questions Join the 19 NCR Mike Hailwood TT discussion group or the general NCR discussion group. Enter your e-mail to join the 2019 NCR Mike Hailwood TT forum and get notification of answers and new messages about this bike. You can unsubscribe with a single click. Bikez does not display, sell	or misuse e-mail addresses. Get a list of related motorbikes before you buy this NCR. Inspect technical data. Look at photos. Read the riders' comments at the bike's discussion group. And check out the bike's reliability, repair costs, etc. Show any 2019 NCR Mike Hailwood TT for sale on our Bikez.biz Motorcycle Classifieds. You can also sign up for e-mail notification when such bikes are advertised in the future. And advertise your old MC for sale. Our efficient ads are free. You are also welcome to read and submit motorcycle reviews.